Several of the medium sized condo buildings in Warriors Mark sit on a small forested park, but the Woods Manor condos for sale are unique in that it’s park is surrounded by an open space owned by the condo association, it backs onto an open space trail on a ridge that separates it from the noise of Highway 9, and it’s set a significant distance from the neighborhood thoroughfare Broken Lance. Beside these specific advantages it also have the great location, open space, Blue River fishing rights and easy access to town that comes with all the homes for sale in Warriors Mark. Are you ready to find your perfect property match? 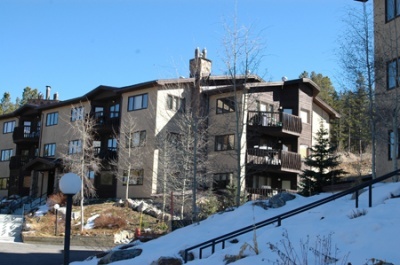 Browse the Woods Manor condominium listings below, or, find out more about this quiet yet close-in condo opportunity in Breckenridge. On site, Woods Manor has a common spa and fitness room, and out the back door is the open space trail that links to Illinois Gulch and to trails in Blue River. It’s easy to get to anything in town, and a free town shuttle bus stops on nearby Broken Lance. Fishing in the Blue River as it runs through Warriors Mark is for residents only, and is a healthy aquatic habitat. These condos are efficient and sunny, mostly two-bedroom units with a balcony. The property does have elevators, and a clubhouse with spa, steam room, sauna, exercise equipment and pingpong tables. Size: 938 to 1338 sq. ft. Amenities: underground parking, open space, off Broken Lance in the trees. From the southern most stoplight in Breckenridge, at Boreas Pass Road, take a right and head west on Broken Lance Drive. Follow this drive as it curves left for less then a mile; turn left into Woods Manor, and you’ll find a parking area, and these condos set back in the trees. Do you have any questions about the beautiful condos at Woods Manor? We would love to talk to you! Send us a message online, or call us at (970) 453-2200.